A 7.8-magnitude earthquake wreaked havoc on Ecuador on Apr. 16, leaving more than 650 people dead and widespread destruction in its wake. The major earthquake and its aftershocks destroyed homes, hospitals, bridges, roads and schools. Men, women and children across the country – especially those living in coastal cities – are currently experiencing complete power outages and are in desperate need of food, drinking water, and medical supplies among other basic necessities. 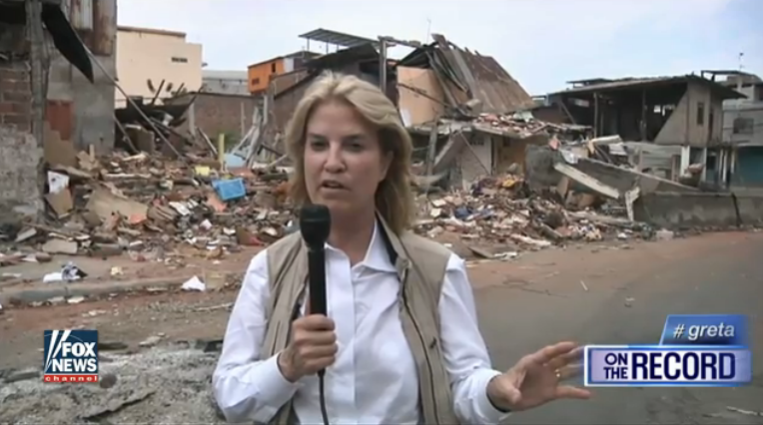 Amid scant international media attention, Fox News’ Greta Van Susteren traveled to the South American nation over the weekend to cover what has become a true humanitarian crisis. "I am shocked how little international help has arrived (that I saw) and even more shocked that I did not see any international media," writes Greta in her blog. "When the media puts a spotlight on a crisis, more people know to help. You can help by just sharing this post and getting the word out." Watch the report below and check out her blog for more photos. Organizations such as UNICEF and Samaritan's Purse are providing emergency relief to Ecuador's afflicted areas.